In a forest of the neighbouring village of Vehlingen, Duke Leopold of Salm-Salm (1886-1908) had a park laid out in 1893 that reproduces the Swiss landscape of Lake Lucerne. 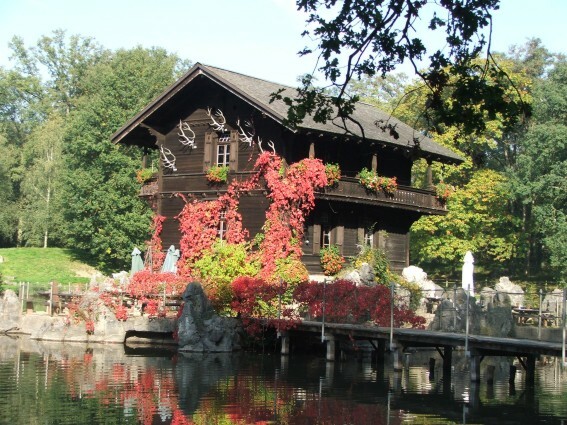 And on a rock in the middle of the lake, Leopold had a little wooden house built in the Alpine style (Schweizer Haeuschen). Today the park around the lake is the home of many European wild animals, such as wolves, elks, bisons and lynxes among others, living in their natural habitats (Biotop-Wildpark).